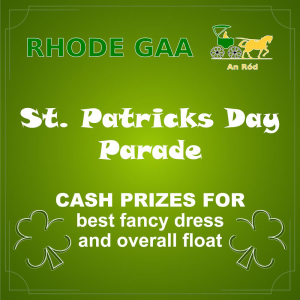 The Celebrations will commence on Sunday the 27th of August with mass for the deceased members of Rhode GAA club at 11:30 am in St.Peters Church Rhode. That evening members and representatives of the 1966/67 Senior & 1967 U,21 Championship winning teams will sit down to a meal in Killeen’s . 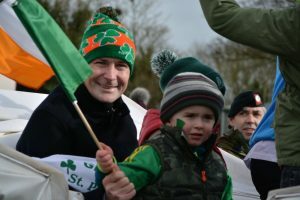 Following this there will be a presentation made to them at 7:30 pm in Killeen’s Croghan lounge which is open to all family,friends and anyone wishing to attend to celebrate the wonderful achievements of these men. Rhode Senior Footballers take on Edenderry in the fifth round of the Offaly Senior Championship this Friday 4th of August in Bord Na Mona O’Connor Park Tullamore at 7:30 pm. Very best of Luck to our Junior Footballers who take on Tubber in the Semi Final on Sunday 6th of August at 6:30 pm in BallyCommon. Please Support all our Teams. Rhode U,12s travelled to O’Brien Park Tullamore last where where both our teams gave an excellent footballing display against Tullamore. Team A: Cian Cocoman, Cillian Dempsey, Daniel O’Brien, Liam Walsh, Ethan Hannon, Ryan Quinn, Ryan Kellaghan, Billy Quinn, Sean Daly, Tiernan Foy, Scott Hannon, Nathan Glennon, Eoin Murphy. Team B: Joshua Kellaghan, Mark O’Meara, Cameron Egan, Matt Heavey, Aaron Byrne, Barry Dunne, Noah Swaine, Ross Kellaghan, Charlie Cullen, Ryan Murphy, Gavin Murphy, Adam Kellaghan. Rhode U,14s were defeated by Na Fianna 8-13 to 4-03 last Wednesday in Ballinagar. Team: Michael Culloty, Conor Dunne, Dylan Kilmurray, Ryan Kellaghan, Ryan Murphy, Shane Murphy, Sean Choudary, Gary Kiernan, Joe McBride, Cian Murphy, Jack Murphy, Jake Molloy, Ger Cullen, Cian Conroy, Ross Kellaghan. Sub Noah Swaine. Draw takes place on 10th of September and Tickets are €20-00 each or Book of 3 €50. Anyone wishing to support this draw by purchasing tickets can contact James Murphy 087 820 8057 or John Glennon 087 271 5804. 190 boy’s and girl’s took part in the cul camp’s in Fr.Dowling Park Rhode from Monday the 17th July -21st July . The First two days split the stones with sun-shine but from Wednesday on the weather changed but it did not break the spirit of the boys and girls. It was a week jam packed with fun where they showed off their footballing skills to a fine art through out the week. This year again Rhode welcomed Isabelle and Daniel Leavy from (New York USA), along with Gearoid Stones (Boston USA), Sam Robertson (Saudi Arabia) , Cian and Ryan Trumo Harte (Munich Germany ) we were delighted to welcome them to the camp this week and hopefully be back on their holidays with us next year. A big thank you also goes to Minor Club Secretary Tracey Murphy, Oliver Murphy, Robert Kellaghan and Declan Chippy Nolan for their up keep on the field and dressing rooms for the summer camp and making sure everything ran smoothly for the coaches. 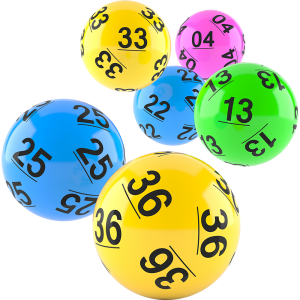 There was no winner of the Rhode GAA Lotto Draw that took place on the 24th of July for a Jackpot of €15,000. The numbers drawn were 8 9 10 17. The club would like to thank all those who supported the draw and thanks to O’Toole’s for the use of their premises and for their help and cooperation. The following matched three numbers and received €30 each.